Demonstrators march in front of the Greek parliament in central Athens during protests against new austerity measures and a rally marking a 48-hour general strike, on November 6. Greek lawmakers vote Wednesday on austerity measures needed to unlock international aid and stave off bankruptcy despite strikes and public anger against billions more euros in tax hikes and pension cuts. Greek lawmakers vote Wednesday on austerity measures needed to unlock international aid and stave off bankruptcy despite strikes and public anger against billions more euros in tax hikes and pension cuts. A general strike was expected to paralyse Athens for a second straight day and Greeks gather in front of parliament to voice their opposition to making further sacrifices as the country heads for its sixth year in recession. Lawmakers were due to wrap up their debate and hold a late-night vote on the package of 18.5 billion euros ($23.6 billion) in new spending cuts and other reforms by 2016. Implementing the austerity plan is a condition for Greece to receive a 31.5-billion-euro tranche of bailout funds from its troika of international creditors -- the European Union, International Monetary Fund and the European Central Bank. Without it, Greece risks running out of money on November 16 when a debt repayment falls due. Despite the country approaching bankruptcy and a possible euro exit once again, many Greeks are angry at repeatedly having to tighten their belts. Police estimated that 40,000 people turned out Tuesday at an Athens rally on Syntagma Square near parliament under banners screaming "No to measures of impoverishment" and "The people above everything else -- not numbers and measures." 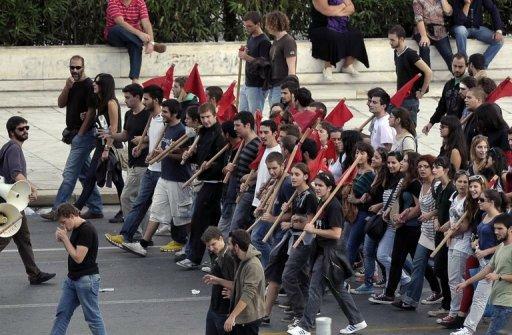 In the northern city of Thessaloniki, 20,000 joined a march. "The people came here today to protest against the measures that bring us back centuries. They are abolishing our rights, and depriving our children's future," said teacher Thanassis Pargas at the rally in Athens. Traffic was paralysed in the capital as public transport workers joined a 48-hour general strike launched Tuesday. Ferry services were also crippled, with ships linking Greece's islands remaining docked. Many flights were cancelled or rescheduled as air traffic controllers staged a three-hour work stoppage. Judges and lawyers also joined the strike while publicly-run museums, archaeological sites and post offices were shut. The measures to be voted on Wednesday include a rise in the retirement age to 67 from the current 65, and cuts of five to 10 percent in pensions of more than 1,000 euros a month. Civil servants' 13th and 14th month pay would be scrapped, and further salary cuts imposed on academics, hospital doctors, judges, diplomats and members of the armed forces. "These measures essentially bring us many years back. 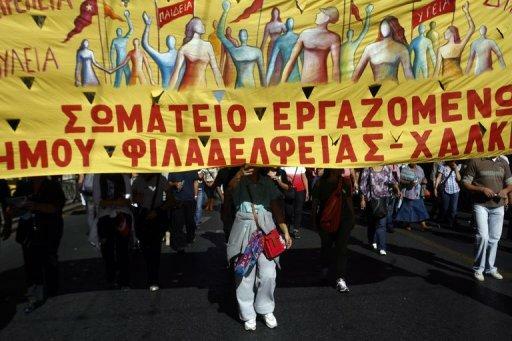 All the labour rights the Greek people won post-World War II and post-dictatorship are taken back," said union activist Marie Lavrentiadou at the Athens rally. "The measures will be voted in (Wednesday), but the measures are not voted in the conscience of the Greek people and they can be ousted," she charged. However the government has warned that the country has no choice but to adopt the measures if Greece wants to stay solvent and in the eurozone. Eurozone creditors were due to make a decision on the bailout funds -- part of a massive rescue package for Greece -- at meeting of finance ministers on Monday.